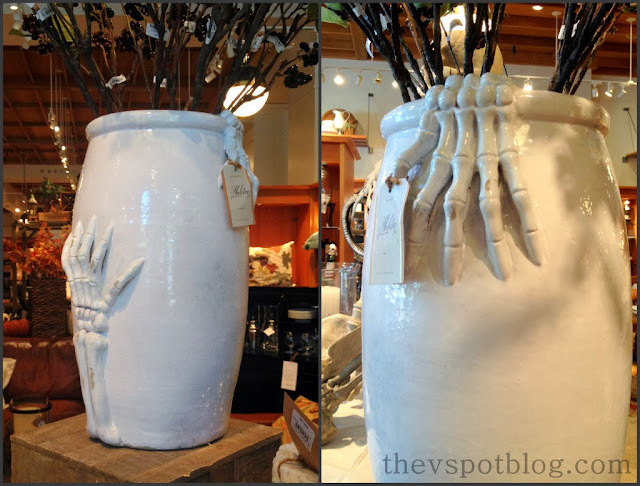 A few weeks ago I was in Pottery Barn, admiring their Halloween decor and decided that I could make something similar at home. 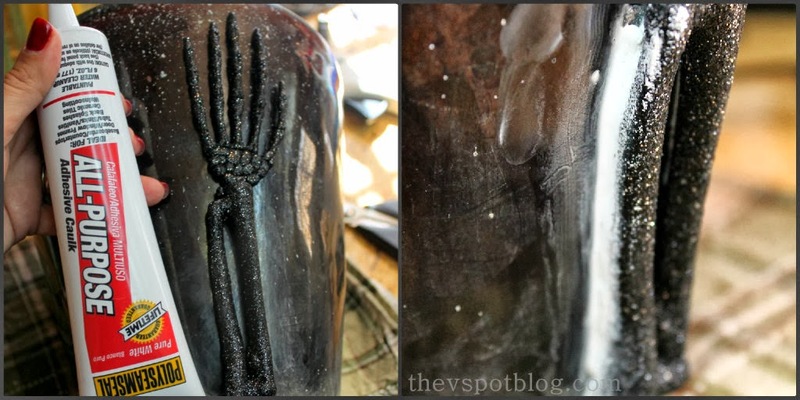 I particularly liked this Bone Hand Vase, but did not want to pay $100 for it… so I decided to try and make my own version for a lot less. Is it exactly the same? Nope. Did it cost me $10 instead of $100? Yep. Can I live with the difference? Yep. Here’s how I did it. First of all, some of you may recall that I have eleventy billion old pots that I am trying to reuse, recycle or just get rid of. This particular one has a crack in it and isn’t long for this world anyway. I grabbed it and a large glittered skeleton from Joann’s who was on extreme clearance due to a missing leg. Since I only wanted him for parts, I was super happy to pick him up for about $8 instead of $40. Woot! This next part sounds terrible, so just read these next lines of text in a creepy mad scientist voice so that it’s more Halloween-y, ok? I took some pliers and I pulled his arms off at the elbow! Then I broke one of his hands away from his wrist bone! Hee hee hee! Then I fired up my glue gun and dripped hot glue onto his bones at the wrist and elbow and stuck him to the side of the pot! Then I took his hand and glued it to the top of the pot! OK, we’re through with the violence, so we don’t need to do the voice anymore. The next step is to get some adhesive caulk and run it along the major edges of the bone. Next step is to let it dry, then take it outside to spray paint. I sprayed the entire pot with a tan colored spray paint and let that dry, then I grabbed some gloss white paint and some Vaseline and got to work. Take the Vaseline and place random swipes of it around the pot and over the bones. This will help you to make the pot look aged when you spray that crisp gloss white over it. Throw the spray painting rules out the window. You want this to look drippy and thick. I think it helps to make the vase itself look a bit like bones. I have done a post using Vaseline to make pots look old, chippy and shabby chic before, but I wiped the Vaseline off fairly quickly. This time I ended up letting it “cure” over night and I did not wipe it off. I liked how it looked. 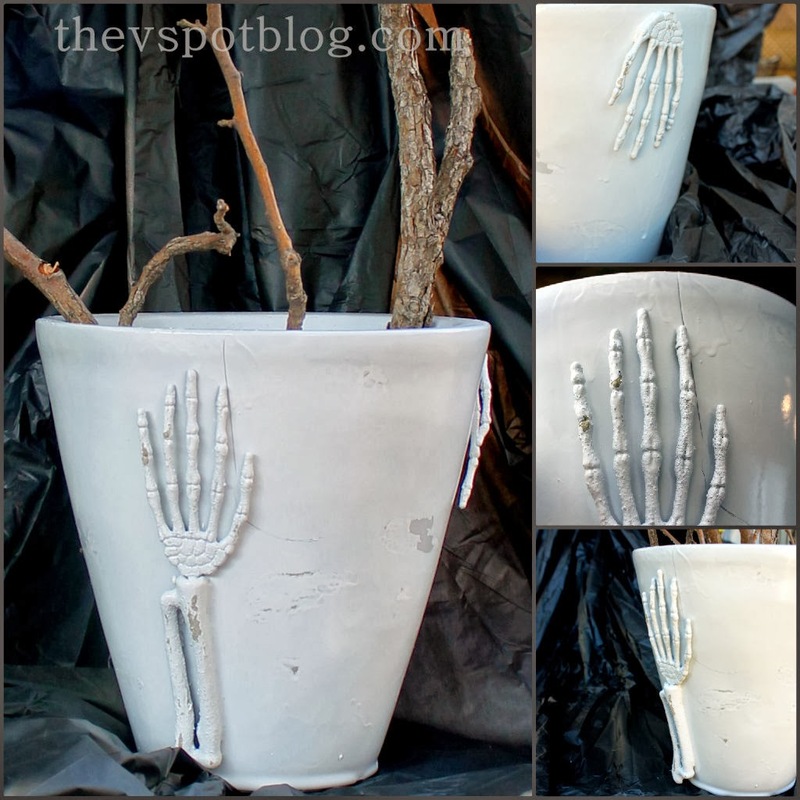 I also like that it looks like the bones are trying to hold the cracked pot together. Serendipity. 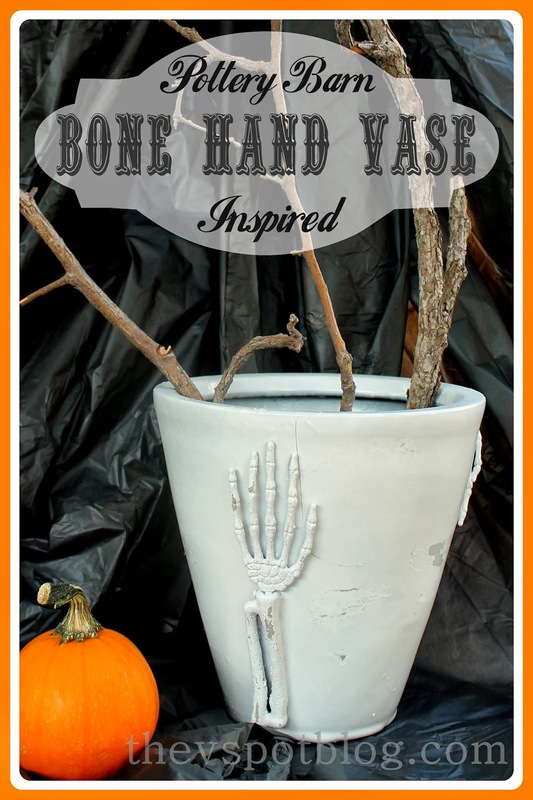 Turns out that my friend Angie created a version of this Pottery Barn Vase on her site The Country Chic Cottage. Be sure to check it out! 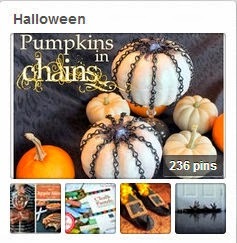 For more inspiration, please check out my other Halloween projects and follow me on Pinterest. This is sooo cool Viv! I love the spooky look and your instructions cracked me up. You are the best! Fantastic project!!! I love it.